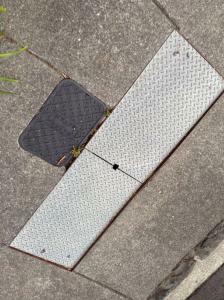 There is a dangerous utility grate in front of 2A Diamond Street in Eden Terrace that becomes extremely slippery when wet. Because it is located on a steep hill in the middle of a narrow footpath, it is easy for people to slip and fall. Some sort of non-slip coating would be appreciated.